Computerized voting machines have been operating for over a decade and Texans don’t trust them–and now we know why. Dr. Laura Pressley’s historic election contest has uncovered electronic voting machine corruption errors, security breaches, missing back up tapes and no ballot images exist for a legal recount. Candidates all over Texas have known about these illegalities for over a decade and Pressley is the first to take the responsibility to address them in the Texas courts. Pressley’s critical appeal and final legal brief was recently filed with the Third Court of Appeals in Travis County. Completion of Pressley’s brief is a result of the support of so many that have spread the word, have contributed and enabled this case to move forward. Thank you to everyone! Breaking News for 2016 Primaries: Similar Illegalities and serious election irregularities, that occurred in Pressley’s election, recently recurred in Texas counties during the 2016 Primaries. Votes were flipped on computer screens. Copyright © 2016, Laura Pressley Election Legal Fund All Rights Reserved. Political advertisement paid for by Laura Pressley Election Legal Fund, 10203 Woodglen Cove, Austin, Texas, 78753, Fidel Acevedo, Treasurer. This campaign has not agreed to comply with the contribution and expenditure limits of the Austin Fair Campaign Chapter. 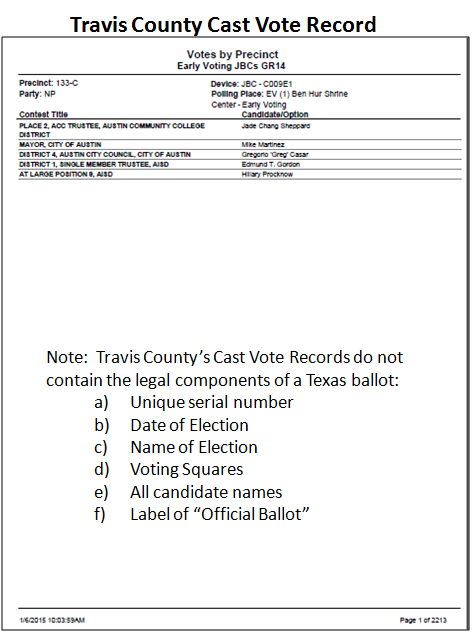 Election fraud “, and “voting irregularities”…………..nothing new even at the county level. Such just lends more credence to a 2-term limit for any elected “official” and after such, forever forbidden from holding another “government” job in any capacity. Even down to precinct chairman or county chairman of any political party. And most certainly for any paid position. County judges, commissioners, JPs, sheriffs, elected clerks…………..anyone and everyone. Things just get to be a bit too cozy, when the same elected-appointed hacks retain office and the natural politically-incestuous tendencies to stay in power, move the will of the people further out of the picture. Electronic voting machines and their hackable data have reached epic proportions of suspicion and confirmation. I suspect 2-3 elections in Parker County may have been subject to such over the last decade, truth be known. Think George Parr-Box 13-Landslide Lyndon on steroids. The Akron Beacon Journal is reporting that the private plane of the GOP’s highly-placed “IT guru” Mike Connell’s went down in Lake Township, Ohio on Friday evening. Connell was killed in the crash and is reported to have been the only person on board. There are no reports of anyone on the ground being hurt, though his plane crashed in a residential neighborhood. Connell is a familiar name to readers of The BRAD BLOG as a key witness in the King-Lincoln v. Blackwell lawsuit regarding fraud in the 2004 Presidential Election in Ohio. That recently revived, long-standing lawsuit led to Connell’s recent deposition on November 3, 2008, the day before this year’s general election. According to plaintiff’s lead attorney Cliff Arnebeck in July, a tipster had warned that Connell had been threatened by Karl Rove, as The BRAD BLOG reported at the time, in an attempt to intimidate him into “taking the fall” for Ohio election fraud not long after a motion was filed to lift the stay in that case. Cruz PACs Paid Talk Radio Insider $8 Million Dollars – Was Money Illegally Used To Buy Talk Host Endorsements? Reality Check has already shown how “Neutral” Conservative News Websites Breitbart and The Daily Wire are actually fronts for the Ted Cruz Campaign. In our article “The $25 Million Dollar Trump Take Down” we clearly show that the owners of those sites donated over $25 Million Dollars to the Cruz Campaign and then use their websites to promote him. But is Talk Radio also on the take? Reality Check dug into Cruz FEC Filings and discovered the Cruz PACs paid a Talk Radio Insider over $8 Million Dollars, and the endorsements of Glenn Beck, Mark Levin and others quickly came in. In other words, if a Talk Show host like Glenn Beck, Mark Levin, Hugh Hewitt or others was paid money by a campaign to talk glowingly, defend or endorse a candidate, and not disclose that they were paid on-air to the audience, or the radio stations they are broadcast on, they’d be in violation of the law. The station could lose it’s license and the host could be jailed and fined. Politico published an article in December called, “Talk Radio Rallies Around Ted Cruz” highlighting Glenn Beck, Mark Levin and Erick Erickson, amongst others as hosts defending Cruz and bashing Donald Trump (to Cruz’s benefit). If these hosts are doing it on their own, with no payment, it’s perfectly legal. However, if money is flowing to them, and they are not disclosing it, they are violating Federal Law. It’s also been widely reported that, David Barton, the Director of Cruz’s “Keep The Promise PAC”, is also the Chairman of Glenn Beck’s Mercury One Charity. Between January 18, 2016 and February 18, 2016, “Keep The Promise PAC” paid Rigel Strategies, LLC. $1,033,300.00. At the time I posted the article I received a lot of replies from readers telling me who they THOUGHT would run, and win. To each email I replied I was not telling them who I thought was going to run, and win, but rather, I was telling them who was going to win and who was going to lose. Yes, the system is rigged. Because of the “chad dance” which was the finale of the vote counting in Florida in 2000, George W. Bush signed an unconstitutional piece of legislation into law–HAVA (the Helping America Vote Act) which required every State to use electronic voting machines. The Constitution mandates that the States alone determine how votes are cast. The federal government cannot mandate that States surrender the paper ballot and #2 pencil, in which the actual paper ballots were counted–which it did. For that matter, the Constitution also mandates that ALL VOTES FOR PRESIDENT WILL BE CAST IN ONE DAY, and that day is specified by Congress. Early voting is unconstitutional. Here are the actual election results for 2008 and 2012.